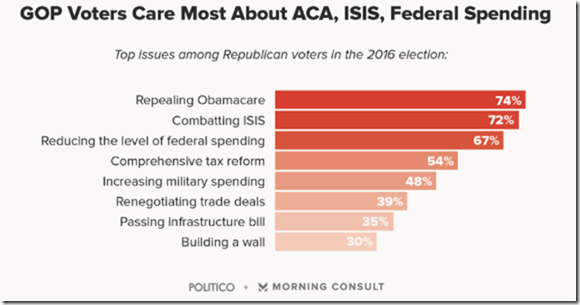 The graph below of a Politico poll of top issues of Republican voters this past November shows that repealing ObamaCare is the top priority. Indeed VP Mike Pence said shortly after the November election that Trump "wants to focus out of the gate on repealing ObamaCare & beginning the process of replacing ObamaCare with the kind of free-market solutions that he campaigned on." Trump did not disappoint on his ObamaCare promise – the very first executive order issued on his first day in office called for all officials to use "all authority and discretion available to them" to waive or delay ObamaCare provisions they deem onerous on individuals, states, or insurers – this will freeze ObamaCare until more steps can be taken. But the Democrats are literally working around the clock to slow Trump down – Dr. Tom Price, Trump's nominee to be Health & Human Services Secretary, who is the key to advancing changes to ObamaCare, has not only had his Senate confirmation hearing delayed he has had it boycotted in that not one Democrat has shown up @ the hearing. Senate Finance Committee rules require @ least one Democrat & one Republican to be present to conduct business. Chairman Orrin Hatch changed the rule & Dr. Price's nomination was moved out of committee; however, the nomination has met a line of single file filibusters with the Price nomination being the third one in line, behind Betsy DeVos (confirmed as Secretary of Education on Tuesday) & Jeff Sessions (confirmed as Attorney General yesterday). The Senate rules call for 30 hours of debate after procedural votes have overcome the filibuster meaning that Dr. Price should become the Secretary of Health & Human Services on Friday morning around 2 AM. What a waste of taxpayer money if only to pay the additional services of people forced to work around the clock while these sessions go on - like Senate janitors. But except for a short time in 2013, when the HealthCare.gov website was having technical problems, ObamaCare has never been widely unpopular with the general public – support & disfavor falling along party lines. Currently 76% of Republicans oppose the law & 80% of Democrats favor it. 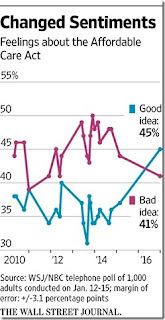 Support for the law among Independents has increased such that the latest WSJ/NBC poll shows for the first time more people think ObamaCare is a good idea than a bad idea – explanation as to why hereinafter. See graph below. Many politicians, like the always unreliable Republican Michigan governor Rick Snyder, are sensing that repealing ObamaCare could affect his state's collectivist expansion of Medicaid which in turn could adversely affect his political career – so Snyder is speaking up for maintaining the Medicaid portion of ObamaCare. How pitiful. The equally unreliable Republican NJ Congressman Leonard Lance sensing the misguided public support for ObamaCare, indicated on the above graph, said "we want to repair the ACA. I have never favored repeal without replacement." Lance's comment is all too representative of Republican thoughts that have increasingly deteriorated into calling for repairing ObamaCare rather than repealing it. The changed sentiments shown on the above graph has a lot to do with this change in mood of Republicans – but disregards pledges made to the Republican base to repeal ObamaCare. In spite of all this, Trump was the first to use the word "repair" in an interview with the WSJ in November. But let's refresh our memories – a very good friend once told me that a problem accurately & properly stated is half way solved. The healthcare insurance problem in America has never been properly stated by Democrats or Republicans. Please remember that a good percentage of the 2009 push for universal healthcare came from the notion that we have 47 million people in America who don't have healthcare insurance. The Kaiser Family Foundation, a left leaning non-profit group frequently quoted by the media, puts the number of uninsured Americans who do not qualify for current government programs and make less than $50,000 a year between 13.9 million and 8.2 million. Ten million of the remaining approximate 36 million are not U.S. citizens @ all (they predominantly use the very costly emergency room treatments @ our expense for free medical care), 8.3 million uninsured people make between $50,000 and $74,999 per year, 8.74 million make more than $75,000 a year, & 9 million did, in fact, have healthcare insurance coverage through Medicare. So out of the supposed 47 million uninsured Americans, 10 million aren't American, 9 million are insured, & 17 million are young and healthy & choose not to have insurance. If BO wanted to get into this why not just have a program to help the 8.2 million to 13.9 million people who really could use the help? This is the correct statement of the healthcare insurance problem. Betsy McCaughey, who is never seen in public without her copy of the 2,000 page ObamaCare law, recently wrote in the WSJ that half of Americans get healthcare insurance through their employer & another 34% are on Medicare or Medicaid. Ms. McCaughey does an analysis that results in her determination that about 500,000 people have pre-existing conditions that would need protection if ObamaCare was repealed – she cites the reestablishment of federally funded high-risk pools as the way to cover these people. The referenced post below includes a section that determined there were 300,0000 people in America in 2013 who had been rejected by commercial healthcare insurance companies (good agreement with Ms. McCaughey's 2016 calculations). The majority of these people were covered by high-risk insurance pools run by the states that were funded by premiums paid by participants, state contributions, contributions from the insurance companies, philanthropy, & charity thereby showing there are ways for people who really need a safety net to find one in America. On January 13 the Congress approved the procedural steps that will allow the House & Senate to consider enacting changes to ObamaCare – reconciliation legislation that lays out the timing & procedural steps necessary for repeal & a replacement of ObamaCare. The nine Republican "Nay" votes were – Amash, Dent, Fitzpatrick, Jones, Katco, Labrador, MacArthur, Massie, & McClintock. The five Republicans not voting were - Mulvaney, Pompeo, Dr. Price, Rutherford, & Zinke. All but John Rutherford were in talks with Trump regarding cabinet positions. Rutherford was recovering from an illness that had put him in the hospital on January 11. Congressman Frelinghuysen recently wrote "Beyond the havoc its (ObamaCare) wreaked in the job market, especially for small businesses, we have seen skyrocketing premiums, soaring deductibles, & fewer choices for patients & their families." Higher premiums. President Obama promised premiums would decline by $2,500 per family. Instead, average annual family premiums in the employer-sponsored market have jumped by about $4,300 and now total more than $18,000 annually. Even higher deductibles. Deductibles for individual plans in the employer-sponsored market are up an average of 60 percent since 2010 – from $917 to $1,478 in 2016. For many families, these higher deductibles are like having no coverage at all. An even bigger bill for taxpayers. Because premiums have skyrocketed, so have the federal subsidies needed to prop up ObamaCare. According to one independent study, taxpayers will pay nearly $10 billion more for subsidies in 2017. Even fewer choices. For 2016, 2 percent of eligible customers had only one insurer to choose from. For next year, that number jumps to 17 percent. In 2016, New Jersey had five ObamaCare insurance providers. This year, New Jersey has TWO! In many more ways than one, concerning ObamaCare, there are differences between 1) repealing, 2) repealing & replacing, & 3) repairing the law. For those, like me, not willing to surrender any more liberty than we already have in America the choice of repealing ObamaCare is the only choice. I consider man's natural condition to be one of freedom & the only proper, moral purpose of government to be the protection of man's rights to life, liberty, & property while protecting him from force & fraud – none of which includes government healthcare insurance programs like ObamaCare. Since the protection of individual rights is the only proper purpose of government, it is the only proper subject of legislation: all laws must be based on individual rights & aimed @ their protection – accordingly, ObamaCare is an abomination that should be repealed. Any healthcare insurance policy should be able to be bought across state lines as opposed to the current system that protects special interests by forbidding such transactions in many if not all states. Removing the barriers to purchasing healthcare insurance across state lines protects individual rights to participate in free enterprise & promotes liberty. If Republicans get into replace or repair they will have bought into a process that can only result in the determination of how badly they will lose. Once Republicans start talking about replace or repair they will have opened the door to universal single payer healthcare & it is just a matter of time before BO & Democrats will have won their centerpiece prize that has been decades coming. Replacing or repairing ObamaCare is a complicated mammoth job. ObamaCare not only affects the 22.5 million people who have acquired healthcare insurance through both the government paid Medicaid expansion & the 75% subsidy funded individual insurance market but also another 71 million people who have had their employer provided healthcare insurance upgraded to conform to ObamaCare mandates - & many, if not all, of these people have come to like these upgrades to their employer's plans. These 71 million people do not want anyone even thinking about changing their improved healthcare insurance plans – that is what is reflected on the above graph that for the first time shows more people thinking ObamaCare is a good idea than a bad one. What's not to like except it cannot be financially sustained. Realizing that over 90 million people are being directly affected is a powerful political lure to make Republicans want to only tinker around the edges of the law leaving much of it in place. But the above realities presented by Congressman Frelinghuysen show that ObamaCare as it currently exists will fall due to its own weight – & when it does Republicans will get the blame as the party in power – a power they campaigned for. If Republicans repeal the law too fast people with healthcare insurance coverage will be upset if the repeal is not done & explained properly – a lose-lose situation. Many people reportedly like their ObamaCare policies. I know of a woman who was paying over $20,000 per year in premiums, before ObamaCare, for herself & her husband – with a $1,500 deductible for each of them. The couple also feared changing jobs because they didn't want to go uninsured for six to twelve months if some preexisting condition was found during the employment transition. When ObamaCare was enacted it cut their premiums in half. They now have small copays & there is no fear of losing healthcare insurance because of preexisting conditions. What is not to like except ObamaCare is collapsing. Not every account is as happy as the one above - a longtime subscriber to RTE recently told me that he is insured under ObamaCare as long as he doesn't leave NJ. In addition, hospitals have taken up the fight to preserve ObamaCare – they are afraid of losing insured patients & the revenue that comes with these patients if Republicans repeal ObamaCare. Hospital executives have already told Congress they expect federal subsidies to be restored if ObamaCare is repealed. Several people have said they are tantamount to being prisoners of their current employer because they are afraid of losing what healthcare insurance they have with their current employer. These people don't change jobs because they are afraid they might lose healthcare insurance coverage for themselves or a family member. But don't people change jobs any more with contingencies with their prospective employer by saying they must pass any required physicals & understand the healthcare insurance coverage provided by the prospective employer before they would accept the job & notify their current employer of their resignation. I remember signing an apartment lease with a contingency that if I failed a pre-employment physical the lease would be null & void so taking a responsible position is not out of the question unless you are looking for someone, like government, to take care of you. Now Judge Napolitano has cautioned of another problem – the Supreme Court ruled in 1970 (Goldberg v. Kelly) that procedural due process is required before a recipient of certain government welfare benefits can be deprived of such benefits – ObamaCare certainly is a government welfare benefit & "medical care" is specifically listed in the holdings of the Court's determination in the referenced case. Once public perception turns for or against some cause or someone who has been fighting for a cause the outcome is usually in sight. BO has left a land mine in ObamaCare for Trump & the Republicans in Congress to dismantle. If Hillary had been elected president the path to universal single payer healthcare would have been very smooth with few initial complaints from ObamaCare policy holders or anyone else who didn't realize what they were giving up. BO is counting on the Republicans making a first-class royal mess of repealing, repealing & replacing, or repairing ObamaCare – whichever they choose - so that not only does universal single payer healthcare become the law of the land, when the Republicans fail, but that Republicans will get the blame for the trouble that BO created in the first place. Democrats have been successful in temporarily slowing Trump's plans for repealing ObamaCare – but the delay will be over by the time many readers see this post. Trump & Dr. Price, who has studied the healthcare insurance issue for years as a member of the House, realize all of the pitfalls described above & are well suited & fit for the fight ahead – which will start this weekend following Dr. Price's Senate confirmation as HHS Secretary. Frelinghuysen is from NJ - Yea! You are right - if it fails the Republicans will be blamed for what BO wrought! Grrrr! 80% of Democrats support ObamaCare because a large majority of Democrats are socialists, with many Ali's supporting some version of Marxism, especially the elites. The fact that a successful businessman is President is the worse case scenario for the Democrats. Trump is a winner but it will take all of his dealmaking skills and raw intelligence to replace it. Great Job in detailing the obstacles.